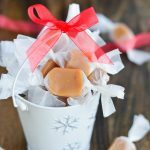 I first shared this recipe on Real Housemoms where I am a contributor. 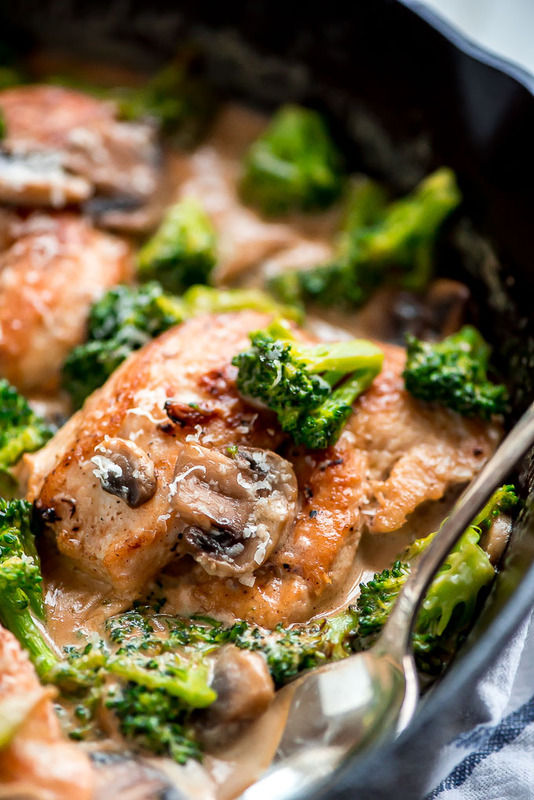 One Skillet Chicken and Broccoli is a super quick, creamy, delicious dinner that comes together in just 20 minutes and is even faster to clean up. Pin it to your DINNER recipe board to SAVE it! Who doesn’t love one pot meals?! The worst part of cooking is the clean up so the less dishes, the better! 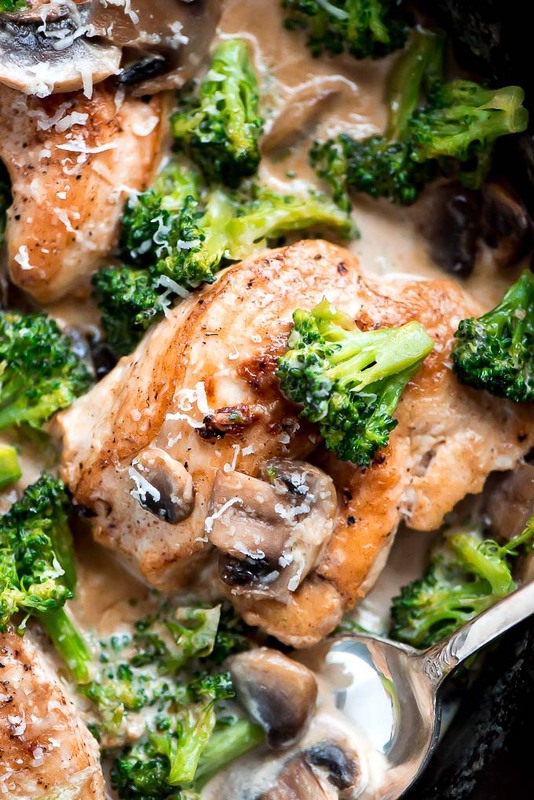 This One Skillet Chicken and Broccoli is a dream! It’s robed in a creamy garlic mushroom sauce that will leave you wanting more. I’m told I’m weird because I LOVE mushrooms and can just snack on them raw as if they were popcorn. Anyone else do this? I just love the texture and earthy taste. 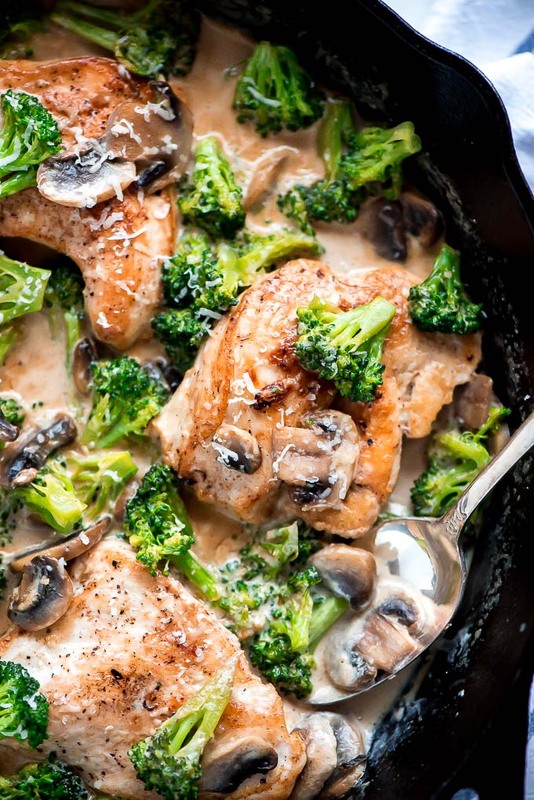 While I do enjoy eating them raw, mushrooms sautéed in butter is something I just cannot pass up and they are right here in this one skillet meal of Creamy Broccoli and Mushroom Chicken. This is such a cinch to make people. Season your chicken, brown it in a skillet, and then cook up your veggies. Add in some cream, cheese, and then add your chicken back in. Voila! As a kid I didn’t like broccoli florets. I’d only eat the stems. Eventually as I got older I got over my childish texture problem and really do enjoy broccoli… especially when it’s covered in a creamy sauce like in Pasta con Broccoli. The florets do an amazing job of soaking up and traping the sauce in between on those little buds. My two year old will just sit there for a minute or two sucking on the end of the broccoli and ends up eating the florets so I call it a win. 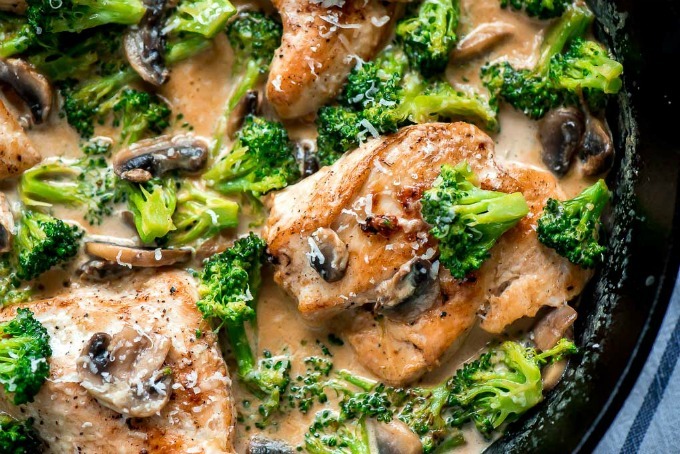 The sauce for this chicken is made right in the same skillet that you used for the chicken and veggies. And it’s so easy! After cooking your veggies, pour in some cream and let it heat up until thickened slightly. Then mix in some Parmesan for flavor and thickness, season with a little salt and pepper and BAM! You are done! Serve it over rice or pasta, and dinner is served. If you’re looking for another creamy one skillet meal, try my Creamy Tomato Chicken Florentine Pasta. Enjoy! Cast Iron Skillet– A cast iron skillet is a kitchen must have. It heats evenly and gives meats a nice crust. Heat oil in a large skillet over medium-high heat. Season chicken with salt and pepper on both sides and cook 3-4 minutes per side until cooked through and to 165 degrees F. Remove from pan. Melt the butter in the skillet over medium heat and add the broccoli and mushrooms. Stir-fry until the broccoli is almost tender. Add the garlic and cook another 30 seconds. Pour in the cream and bring to a simmer while stirring. Continue to stir and cook until slightly thickened. Mix in the Parmesan cheese, season with salt and pepper to taste, add the chicken back in and coat in the sauce and veggies. Serve over rice or past. Could you substitute milk for the cream? If you do you’ll need to add cornstarch to thicken it. This is absolutely delicious and what easy. Husband is a picky eater and he loved it! I made this tonight and it was delicious! I thickened the sauce with corn starch cause it was thin. I served it over quinoa. 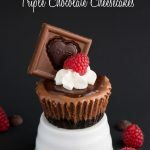 I will definitely make this again! 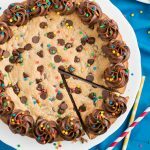 Made this for my family last Friday, and it was as delicious as it was quick and easy to make. My daughter has asked for it again for tonight’s dinner. I was a great meal, thank you! It has a permanent home in my with recipe collections. I used half and half but you can definitely use heavy whipping cream. The heavy cream will be thicker and of course more calories. 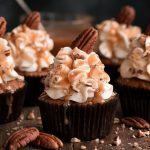 If you use heavy whipping cream, do you use less or same amount listed in recipe?